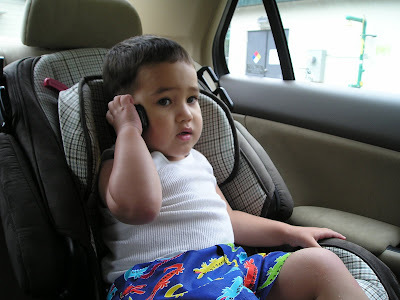 I find it fascinating that almost all kids the I know of love to pretend like talking on the phone to somebody. Rylie always do that then and now EJ is on that stage too. Since EJ's language is not clear yet he would always say "Hewoooo, yoy thee - hello, are you there." He alwayws pretend that he is calling my father in law hehehe. Kids are just amazing isn't it?